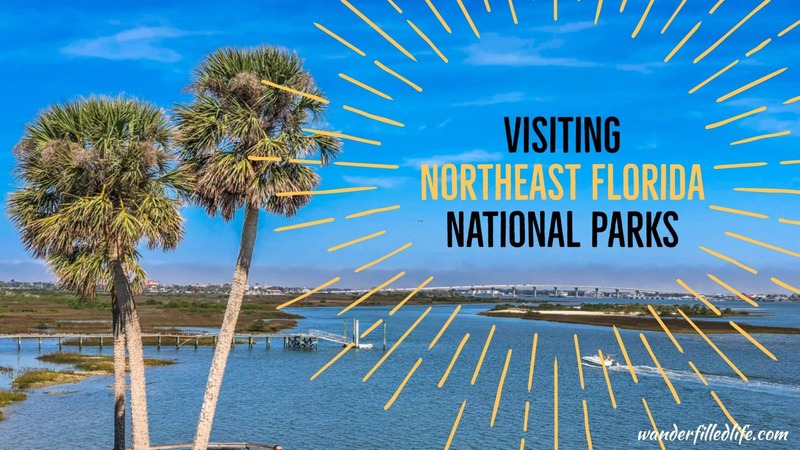 Northeast Florida is not just the home of favorite beach destinations, like Daytona Beach and Amelia Island, but is also home to several National Parks sites exploring the varied history and natural beauty of the First Coast and the Space Coast. 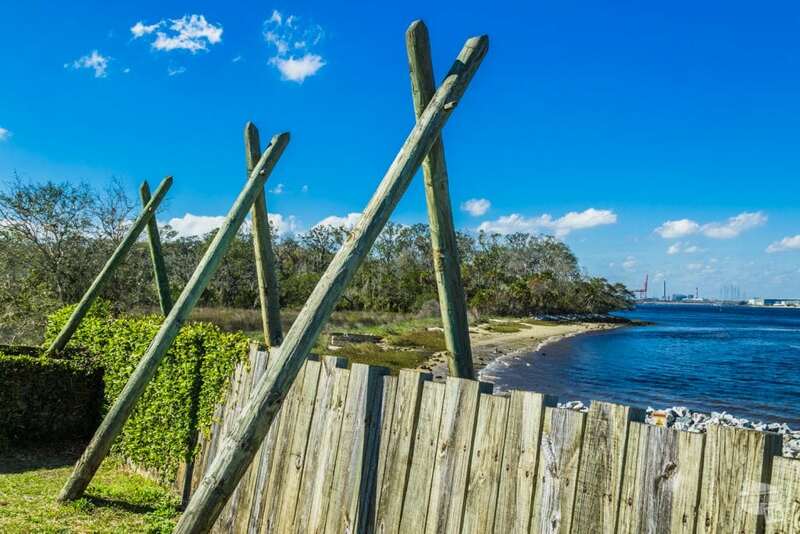 From Jacksonville south to Titusville, these sites tell the story of the Timucuan Indians, the Spanish, the French, British, Confederates and Americans interacting with a beautiful coastal ecosystem. Timucuan EHP preserves two major historic sites, Fort Caroline and Kingsley Plantation, as well as a large amount of coastal marsh along and north of the St. Johns River. 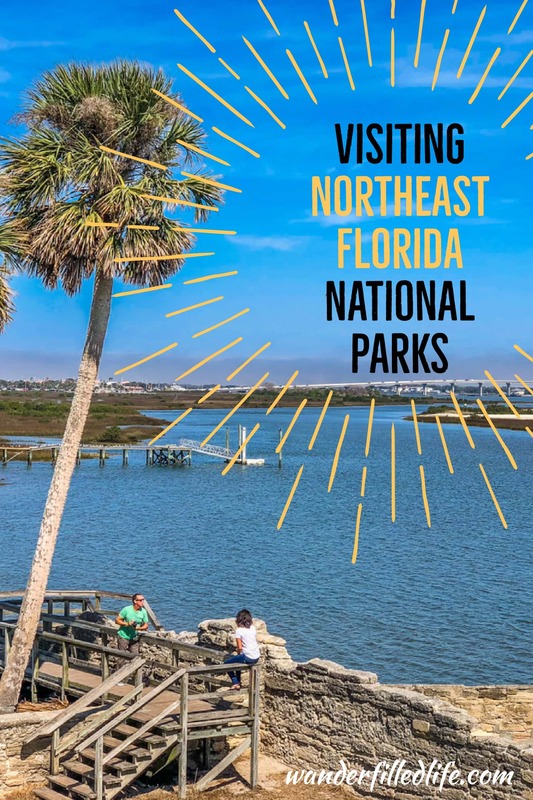 The area is preserved as a partnership between the State of Florida, the City of Jacksonville and the National Park Service, with several state and local parks helping to preserve the area. 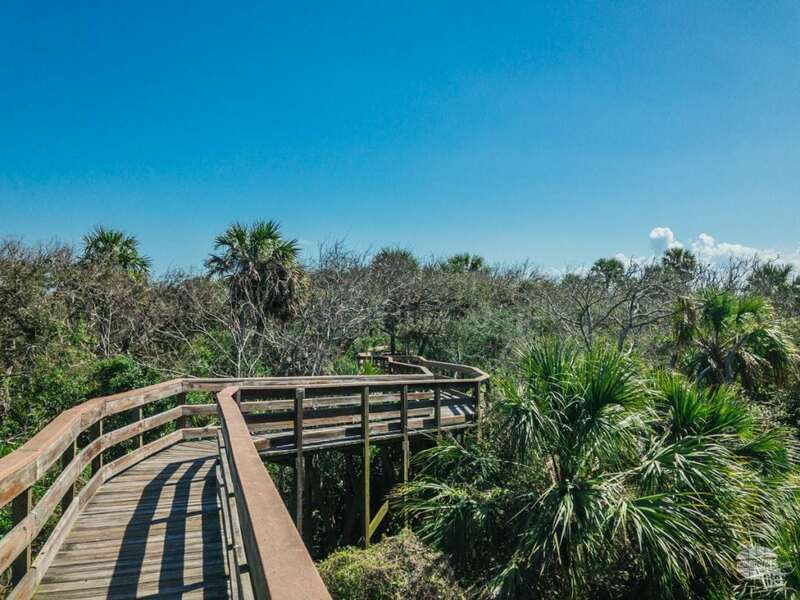 The Timucuan EHP has several trails which highlight various coastal ecosystems. We made a point to visit both Fort Caroline (which is a national memorial itself) and the Theodore Roosevelt Area. We attempted to visit Kingsley Plantation, but missing one ferry and being left off a second ferry meant we were pushing a 90-minute wait just to cross the channel. Pro Tip: If trying to visit Kingsley Plantation, go around via the bridge instead of waiting for the ferry. 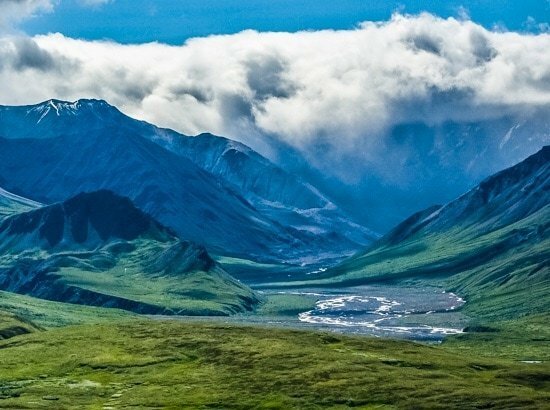 The Theodore Roosevelt Area is a prime example of a regular guy preserving land for future generations. Willie Browne lived on the land his entire life, and the land supported him through fishing, running a sawmill and tending livestock. As Browne got older, he encouraged the public to use his land as a refuge. 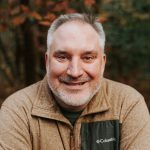 Eventually, he left the land to The Nature Conservancy, which in turn gave it to the National Park Service when the preserve was created. Browne asked the area be named after Theodore Roosevelt, whom he admired as a conversationalist. Round Marsh is a great spot for watching water birds. We saw several birds in the area, including an osprey. 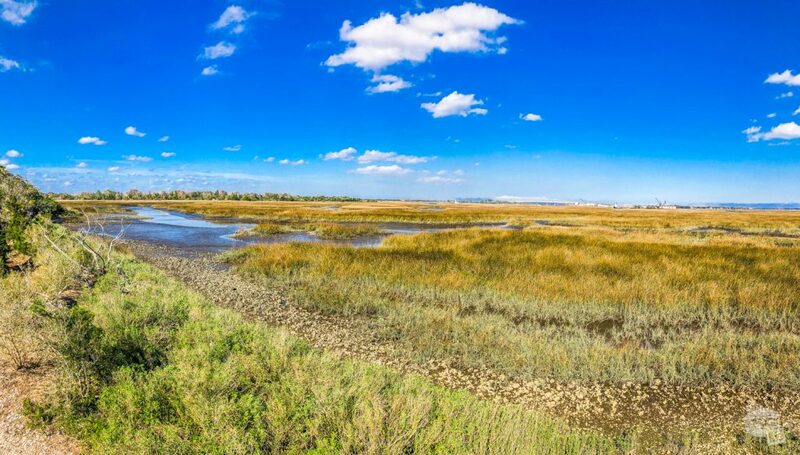 We really enjoyed walking out to Round Marsh and exploring the easy trails of the area. It is not a huge area (about 600 acres), but it is very peaceful. 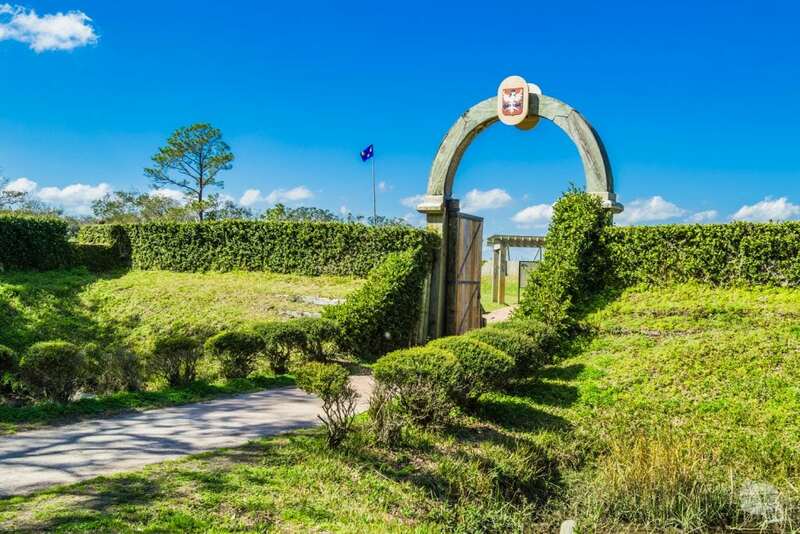 I had no idea, before visiting Fort Caroline, the French had tried to settle in Florida. The French wanted a place in North America and La Caroline was the first choice. They sent Huguenots (French Protestants) to settle the area. Fort Caroline was a small triangular fort along the St. John’s River near modern-day Jacksonville. Needless to say, the Spanish did not take kindly to the French settlement so close to St. Augustine. While French troops moved south by sea to attack St. Augustine, Spanish troops marched two days overland to attack the fort. They killed most of the inhabitants. The Spanish did not take kindly to the French settling in the area and attacked the fort, slaughtering the settlers. The National Park Service has rebuilt Fort Caroline in an approximation of what the fort was. Compared to other forts we have visited, it is small. The triangular shape reminds me of Jamestown, but it is smaller than that. In terms of time to visit Timucuan EHP, you can visit the main sites in a day easily. That said, you can easily spend more time exploring the backcountry with a canoe or kayak. As I said earlier, plan on avoiding the St. George’s Island ferry by driving around. We learned the hard way that getting on the ferry is not guaranteed, even if you are in the queue to get on. 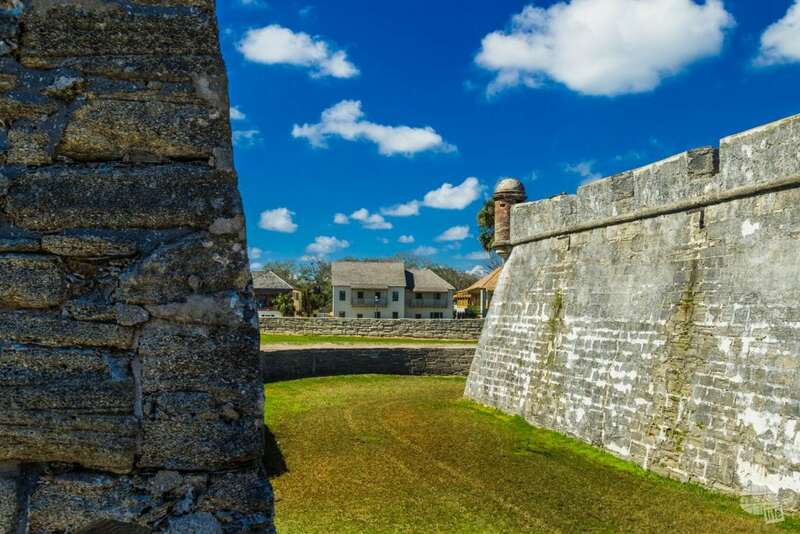 Fort Matanzas NM is located about a 25-minute drive from St. Augustine to the south. Following the slaughter of the French troops by the Spanish, the Spanish decided the inlet was a way attacking forces could advance on St. Augustine. The result? A small fortification which held five cannons and a detachment of up to 50 men, but typically only held seven. 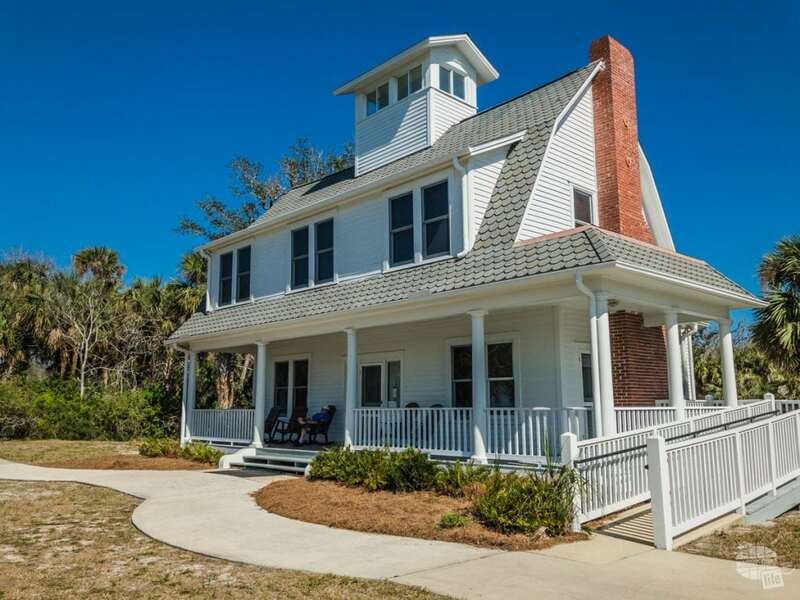 The outpost served as an early warning for attacks on St. Augustine as well as a rest stop and coast guard station. 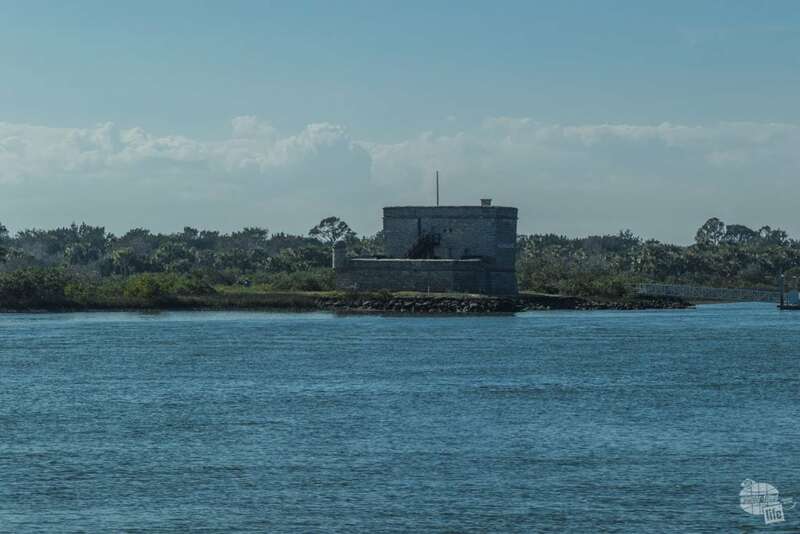 Fort Matanzas is a small fortification south of St. Augustine. Unfortunately, the ferry dock was damaged by Hurricane Irma, so we couldn’t get out there. The fortification is located on Rattlesnake Island and is typically serviced by a passenger ferry. Unfortunately, the ferry dock on the island was damaged by Hurricane Irma in September 2017. According to the Park Service, there is no timeline for repairs to the dock. You can see the outpost from the visitor center and there is an excellent nature trail. The park also has beach access and fishing opportunities. 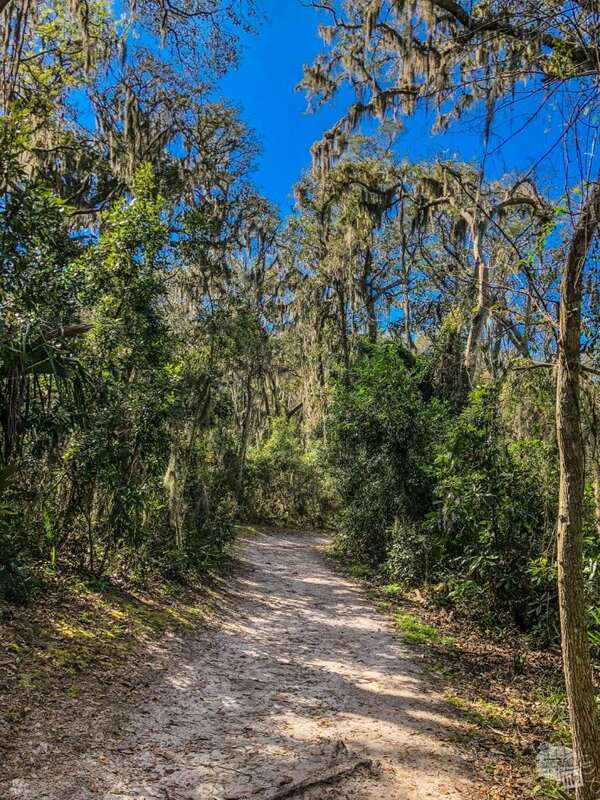 The Fort Matanzas NM has a short, but great nature trail leading through the live oak forest. 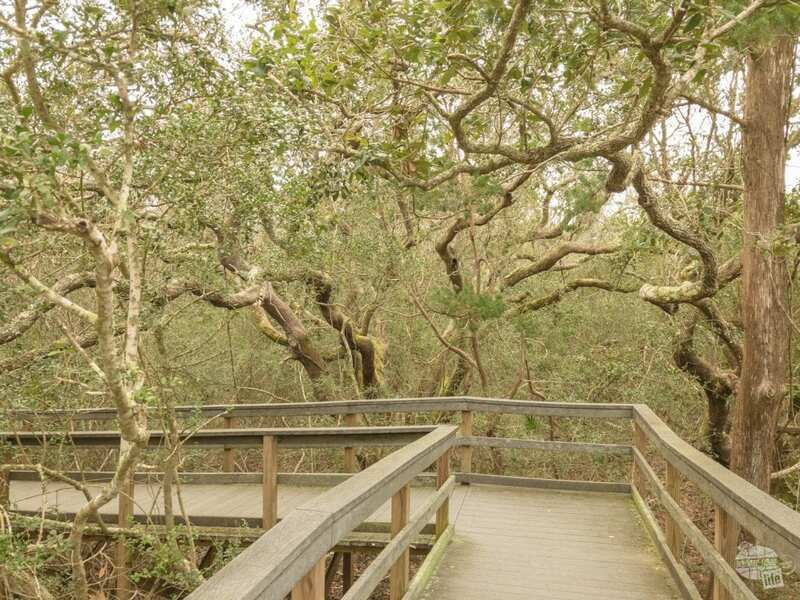 The nature trail follows a boardwalk through live oaks and other coastal vegetation. Until the ferry is repaired, you can easily see most everything at this park in about an hour. 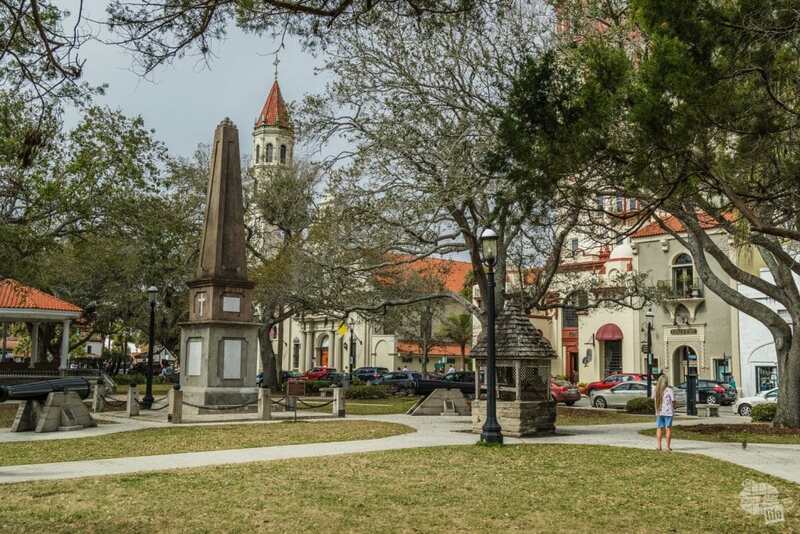 St. Augustine is the oldest continually occupied city in the US. Founded by the Spanish in 1565, it remained a major Spanish port until 1821, with a brief period of English rule from 1763 to 1783. The Spanish heritage of this city is felt everywhere you go. The main street on the waterfront is Avenida Mendez. The main park is the Plaza de la Constitucion, named in 1812 for the Spanish Constitution. The oldest public park in the US, it is named after the obelisk in the center of the park celebrating the Spanish Consitution. We spent the afternoon walking the streets of St. Augustine, soaking up the great atmosphere and enjoying the architecture. We found a great little Cuban cafe in old town, La Herencia in Old Town, for some sandwiches before more exploration. Looking for shops? You can find all of the shops on St. George Street in St. Augustine. 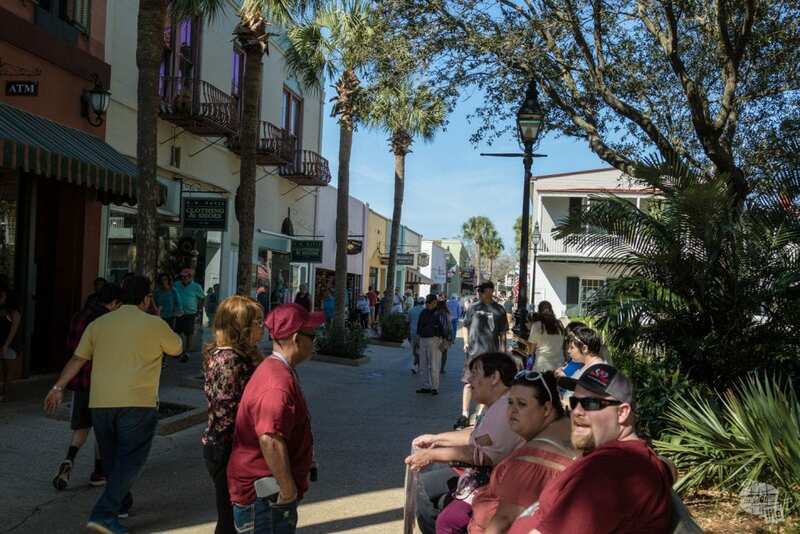 While you are in St. Augustine, be sure to check out St. George Street for tons of shops and fun. 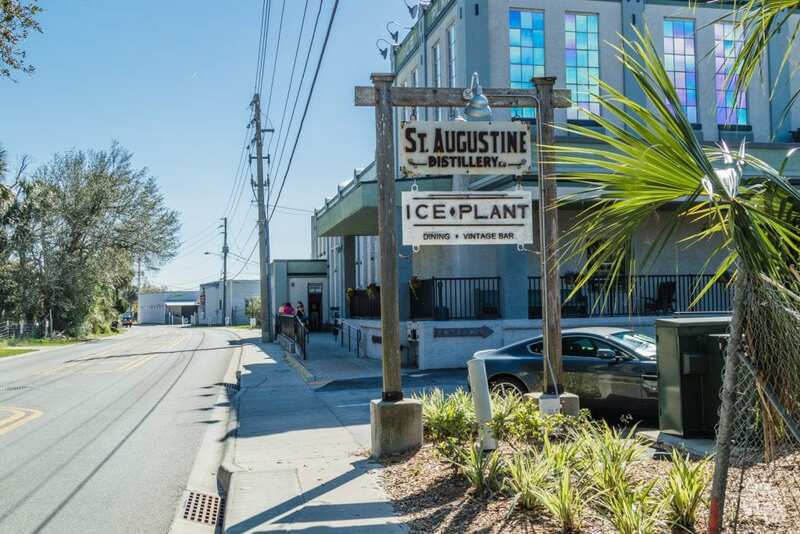 A 15-20 minute walk away from historic downtown will get you to the St. Augustine Distillery. We sampled some mighty tasty whiskey there and they offer tours of the distillery itself. Castillo de San Marcos NM dominates the waterfront of St. Augustine. This Spanish coquina fort was used by Spanish, British, Confederate and US forces nearly continually from its construction in 1695 until 1900. The round garita is a staple of Spanish fortifications, allowing a rifleman to defend the walls without taking fire. The fortification is an outstanding example of Spanish fortification designs, including the garitas, or sentry boxes, at each corner. The British besieged the fort twice, but did it not fall. The use of coquina allowed the walls to absorb cannon fire effectively. 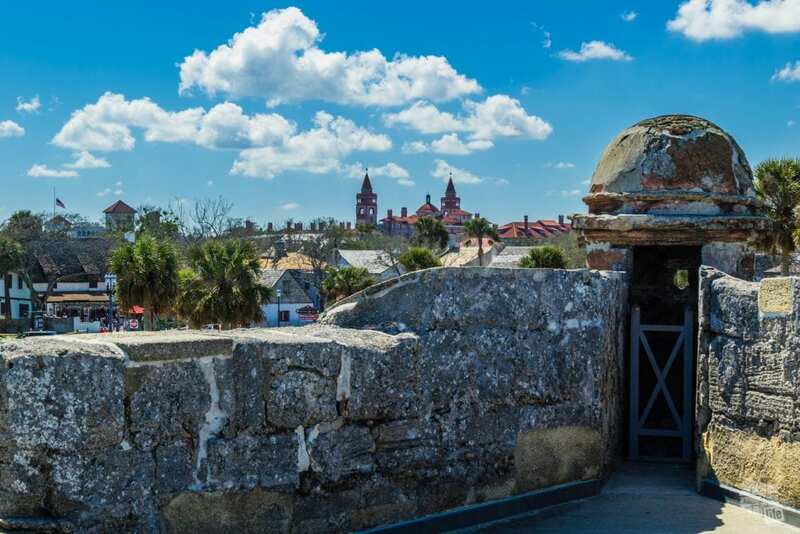 The skyline of St. Augustine from the walls of Castillo de San Marcos with a garita in the foreground. The fort preserves different time periods throughout. There are exhibits on the Spanish use of the fort, the Seminole prisoners kept there and the use by the Confederates and the US Army both during and after the Civil War. Plan on spending an hour or two exploring the fort and make a point to check out any living history exhibitions the park service offers. 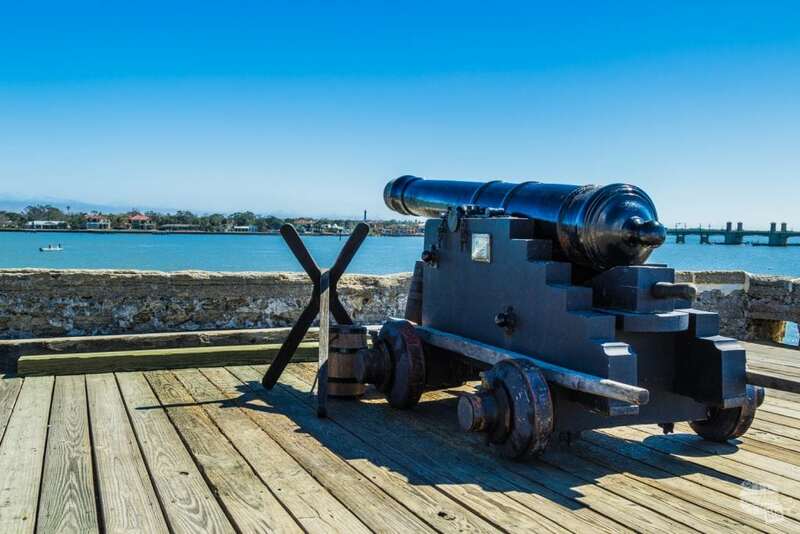 Protecting St. Augustine from attack from the sea was the purpose of Castillo de San Marcos. Canaveral NS is located between New Smyrna Beach and John F. Kennedy Space Center. 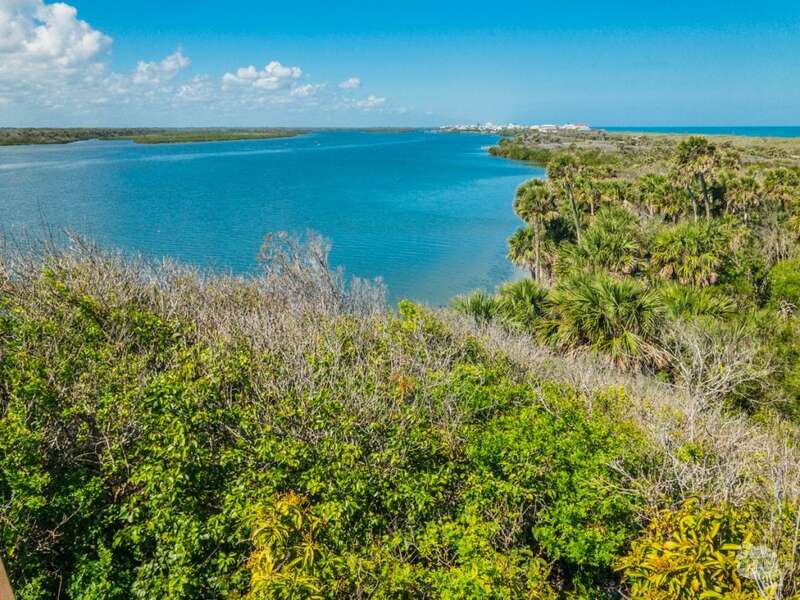 The seashore preserves a large coastal area, as well as Mosquito Lagoon and large parts of Indian River, along with Merritt Island National Wildlife Refuge. Since we visited Apollo Beach on a holiday weekend, we expected the seashore to be a bit busy. The weather was nice and there was some traffic headed for the beach in New Smyrna Beach. Sure enough, when we arrived at the park entrance, there was a sign saying all parking lots were full. Still, we decided to head in and see what we could see. The park service protected Turtle mound with a boardwalk, which allows visitors to see the midden, but not damage it in the process. Our first stop was Turtle Mound, a shell midden just inside of the park. A shell midden is a large pile of oyster shells placed there by the Timacuan Indians. The park service has erected a boardwalk to preserve the midden, which provides some great views. Surprisingly, there were plenty of parking spots. Mosquito Lagoon from the top of Turtle Mound. Turtle Mound is a large mound, or midden, of discarded shells from the Timacuan Indians. We passed by a couple of parking lots on the side for beach access, which all seemed full, but we found plenty of empty spots at the visitor center. Indeed, we found ample parking at all of the non-beach attractions and even some parking further in at some of the beach parking lots. The Eldora State House is all that remains of the small town of Eldora. Eldora was a small community of farmers from around 1877 to 1898. Slowly, the town’s focus shifted away from farming to being a winter home for the wealthy. All that remains today is Eldora State House and a few citrus trees scattered throughout the island. Park staff give tours of the house when available. 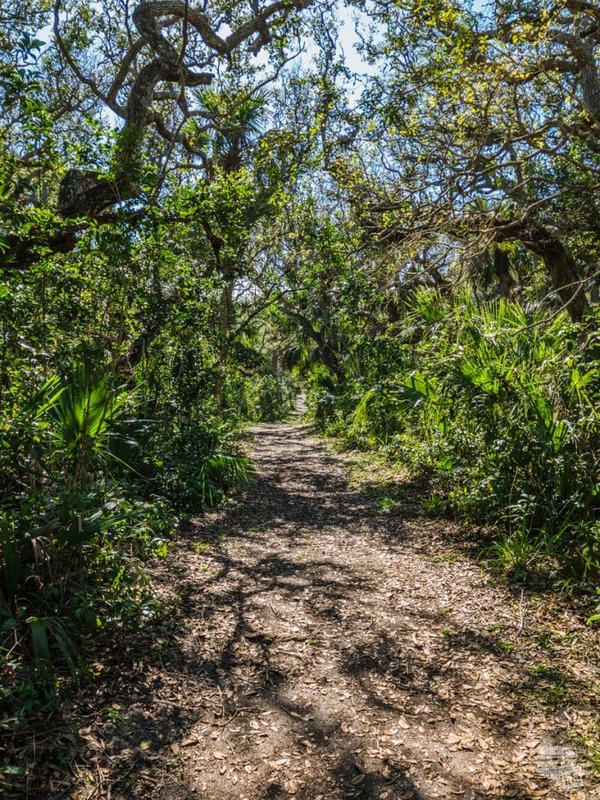 The Castle Windy Trail leads from the beach to Mosquito Lagoon. We did manage to get out for a brief hike across the barrier island at Castle Windy. The trail was relaxing and informative… Just be sure to take the trail guide and look for the signs. When we finally made it out to the beach, we found, even with the parking lots so crowded, there was no crowd on the beach at all. 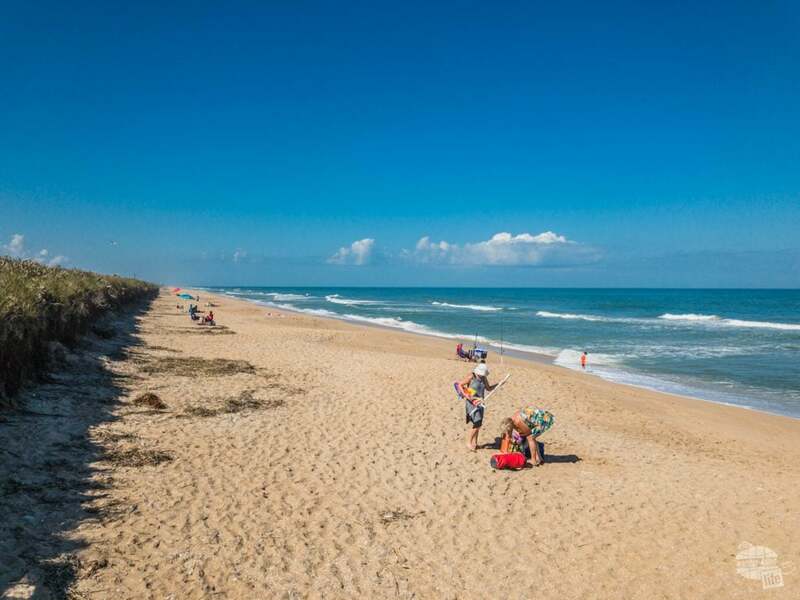 Even on a day when the parking lots are full, there is still a lot of open space out on the beach in Canaveral National Seashore. 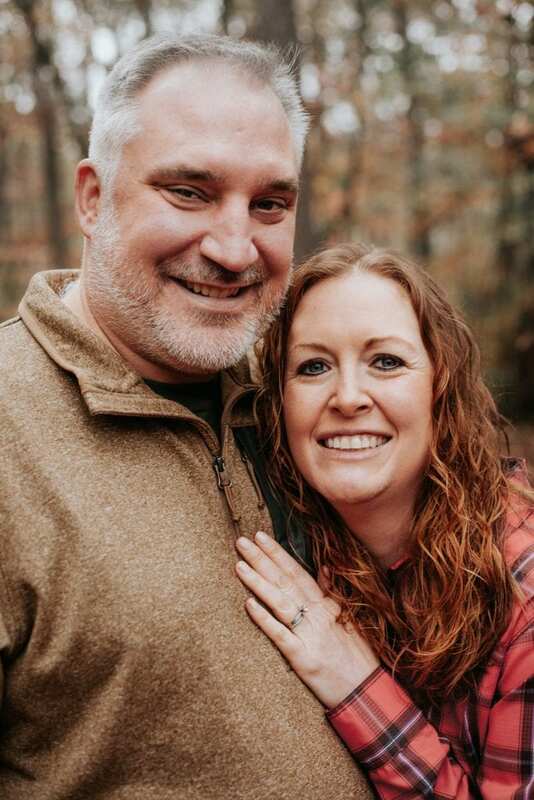 For our first night on this trip, we drove down from Atlanta after work and stayed at the Hampton Inn in Waycross. It was perfectly comfortable and we would certainly stay here again when we come back to explore the Okefenokee Swamp. It made a good stop on the way to Jacksonville to visit Timucuan EHP and Fort Caroline. St. Augustine has seriously embraced its Spanish past. 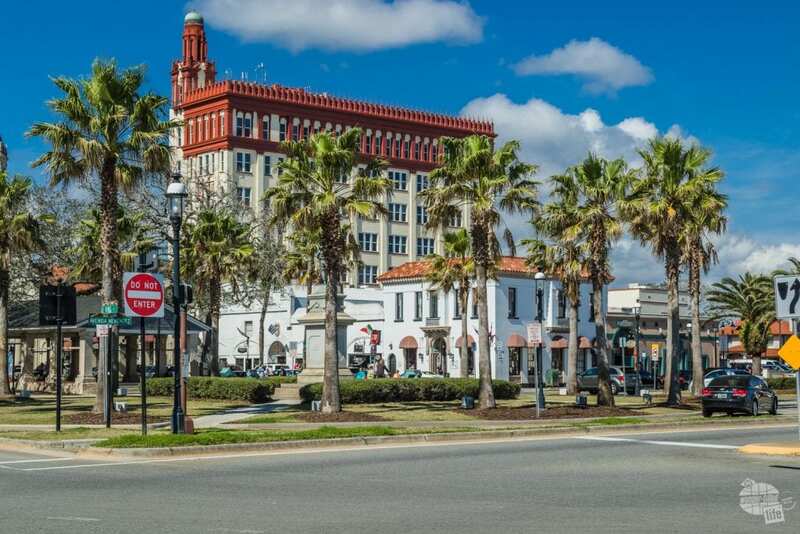 Ideally, we would have stayed in St. Augustine, but it was the same weekend as the Daytona 500, so race fans booked hotel rooms all over the area well in advance. Since this was a bit of a last minute trip, we ended up staying in Palatka, about 30 miles inland of St. Augustine on the St. Johns River. We had high hopes for Palatka. We were able to get a room overlooking the river for 20,000 points/night at the rather nice Hampton Inn. 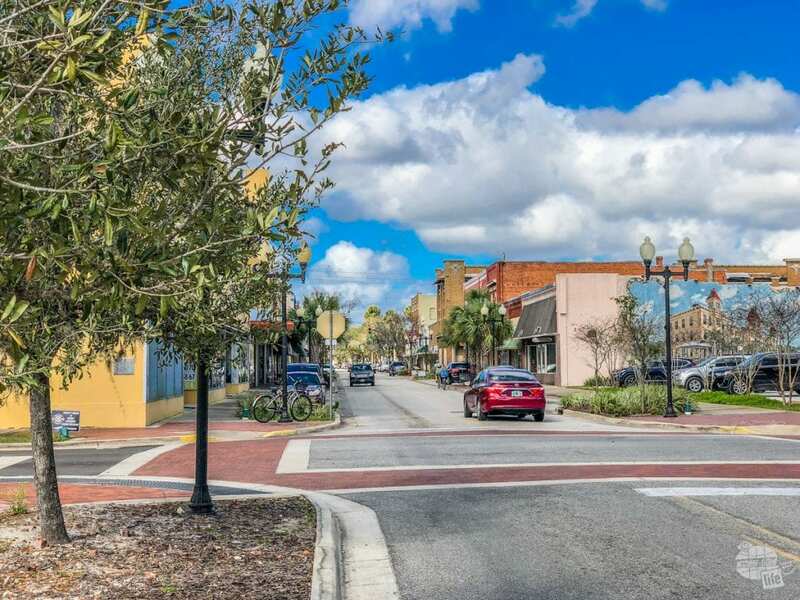 Downtown Palatka was pretty but lacked a reason to visit. Honestly, Palatka did not impress us. We were staying right in the historic downtown, which had very little, other than the pretty good Hawg Wash BBQ Joint, to get excited about. The town’s top restaurant, Corky Bell’s Seafood & Steak at Gator Landing, which ran out of reservations on Saturday night, was middling at best, when we visited on Monday. We have stayed at plenty of small towns all over this country and generally enjoy finding the hidden gems of restaurants, etc. within. We did not find that here. That said, Palatka is a comfortable city with all the expected amenities at reasonable prices.